You were ambushed by a group of thugs on your way through the dense woods near your home. They took everything and left you for dead. You awoke to the sound of howling wolves and have been on the run ever since. It is now after sunset and your strength is failing. The wolves are closer than they have been all day. Suddenly, just ahead you see the outline of a small building on the next hilltop. It is illuminated by the moonlight, but all of the windows are dark. As you near it, you see that the building is in a state of decay. But it may provide you shelter from the wolves until you can rest. There may even be weapons inside. 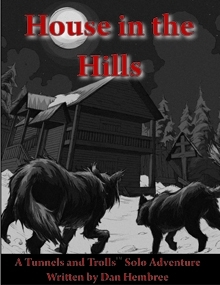 Do you dare enter, the HOUSE IN THE HILLS? This solitarie adventure is suitable for a single low-level, humanoid warrior with up to 20 personal adds. You may bring no weapons, armor, or equipment except for the clothes on your back. House in the Hills is designed to be played using the Tunnels and Trolls™ game system. You will need the T&T™ rules to play this game. This title was added to our catalog on February 12, 2010.